It's a brand new year and yet my Etsy shop looks much like it did in 2007. The poor shop has been a bit neglected because I've been doing a lot of extracurricular sewing this month. 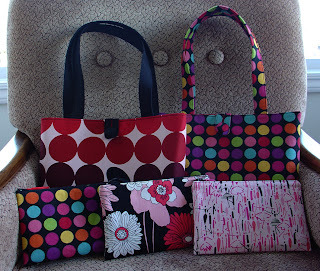 First, I sewed up a passel of bags for my sister's birthday. I call it "The Light Bright Bag" because it makes me think of the Light Bright toy we shared when we were kids. For those of the younger set, a Light Bright was a backlit panel with a grid of little holes over black paper that you could poke plastic pegs into to make glowing designs. Oh, here's the updated version. My sister picked the fabric for this bag and I think it underscores her excellent taste. If you ever see me wearing anything cute or hip, there's a 95% chance it was a gift from her! 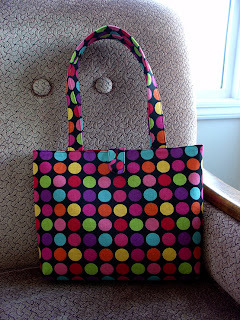 I also made a bag for a Pattern Review I did for Sew, Mama, Sew. The review will appear early next week and I'll post some pics after that. It was a lot of fun to make a bag from someone else's pattern! It's so easy to follow my own well-trodden path and get into a rut. I've been thinking of doing some more pattern reviews here. What do you think? Anyways, now that my extracurricular sewing is finished, I'll be working on my new handbag design this weekend and hopefully will have one or two for my shop on Monday. I'm the lucky sister that got all the wonderful bags shown! I just love them and am so proud to show off my big sister's fantastic works of art. I love that she named the light bright purse after one of our favorite toys. The other fun toy we had was the tootsie roll candy mold maker. But anyone that knows me, knows I wouldn't use a brown purse...even if it was inspired by a favorite toy! In any case, I love my bags and purses!!! Thank you Mo! They we're the BEST Birthday gifts ever! Yep...that is one lucky sister you have! Everything is soooo cute...that light bright purse is fabu! Great job, you! I just found your blog & like your phrase "extracurricular sewing" - that gives so much purpose to the not-for-sale items we all make! I love it! Thanks for the helpful review on the Sophia Carry-All pattern. Your bag looks great! I'm still pretty new to sewing and was wondering if I would be able to tackle the pattern yet or not. If you have any suggestions for some easier bag patterns to start out on (so that I can eventually work my way up to Sophia), I'd love to hear them. Thank you so much for the review of the Sophia Carry all. I do have a quick question. Did you use the Timtex or only the Deco Bond. Also, was your zipper a hidden one? I am about to tackle that project, but wanted to check first. Thank you again for the great information. I love the bags! Those are some really great fabrics! Lucky sis! la manosa-I highly recommend Amy Karol's book "Bend the Rules Sewing". It has some really pretty bag patterns as well as lots of other fun projects. U-Handblog (http://u-handbag.typepad.com/uhandblog/) also has some fun tutorials for beginning sew-ists. christy-I did use the Decor Bond with the timtex for the Bottom Panel. Together they make the bottom nice and sturdy. The given instructions have you trim off 3/4" all around the timtex piece so it doesn't interfere too much with installing the panel. For a zipper , I used a Coates and Clarks 22" purse zipper. The way the zipper is installed makes it look invisible. However, I couldn't get my zipper to work using the pattern instructions and installed mine a little differently! Instead of basting the two front panels together and basting the zipper from the wrong side of the panels, I left the front panels open, glue basted the zipper in place and carefully sewed in the zipper from the right side. Then I could see exactly where the center of the zipper was. Does that make sense? Thanks again for all your compliments! They make my day! I can't thank you enough for your help. I just finished the Madison bag with the modified instructions from her website. It calls for the Timtex. It is so stiff, that when you are sewing the sides it wrinkles and the wrinkles will not iron out. I have the pattern for sophia and weekender. I just didn't think I wanted to see the same results. You have been so helpful. I just love your bag and will go ahead and try it. Have a great day! Thanks again. Wow. I'm impressed with the birthday presents for your sister. That's a lot of bags. Wow - you've been busy! I've been meaning to tell you again how much I LOVE my brown corduroy bag that I bought from your shop. It goes with me everywhere! I just love it and it holds so much - you're the best! Oooh, I'm so happy you like your bag, Jenn! I hope it's keeping all your stuff nice and warm with all this cold weather!